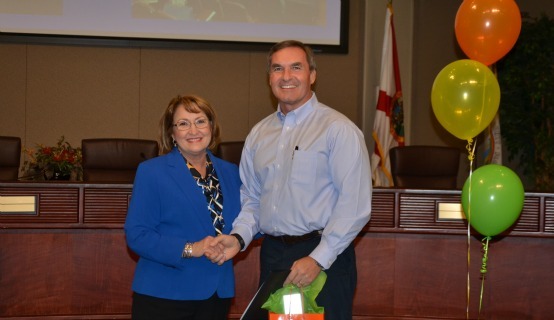 Orange County Mayor Teresa Jacobs provided the welcome remarks for members of the fourth graduating class of the Orange County Experience at the Board of County Commissioners Chambers on Nov. 20. The 11-week educational program, which kicked off during the summer, provides citizens and community leaders the opportunity to learn more about Orange County Government and the vital services that the County provides to the region. This year’s graduating class consisted of 20 citizens who were provided an inside view of the internal operations of Orange County from technology and infrastructure to neighborhoods and health and family services. Orange County staff provided presentations and tours of the Convention Center, Fire Rescue, and Parks & Recreation. During the series, participants have the opportunity to meet staff and take tours of various Orange County facilities and departments. Graduates of the program often go on to serve on citizen advisory boards and continue their service through other volunteer opportunities. Alan Morrison, a citizen and graduate of this year’s Orange County Experience program, enjoyed the class and encourages other citizens to participate in the program.